Market State 2 returns to MS 1 approximately 75% of the time. About 26% of all Bull Market State days are spent in MS 2. Canterbury Volatility Index (CVI 50): The Market’s CVI levels remained flat for the week at CVI 50. CVI 50 indicates a low risk environment. As a reminder, high or increasing CVI is a characteristic of a bear or transitional market, whereas low or decreasing CVI is a bullish characteristic. CVI has been declining since its prior high of 102 set in April. Rotation amongst favorable securities is inevitable. There is no singular asset class that will always outperform; and no asset class that will always lag behind. All liquid traded securities will have bull and bear markets. As an illustration, lets look at international equities. About one year ago, we discussed how the dollar and international equities were linked to each other (see August 7th, 2017 Blog). In this blog, we showed how when the dollar was underperforming most major currencies, international equities were outperforming. Today tells a different story. 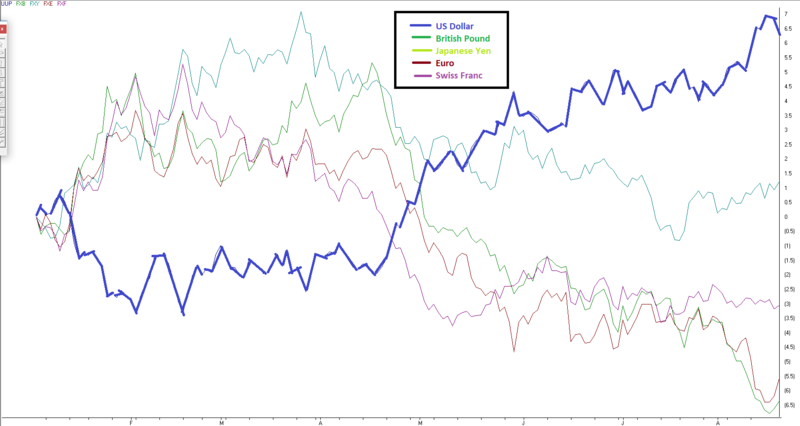 Notice how around March of this year, the dollar begins to pick up momentum while other currencies begin to fall. 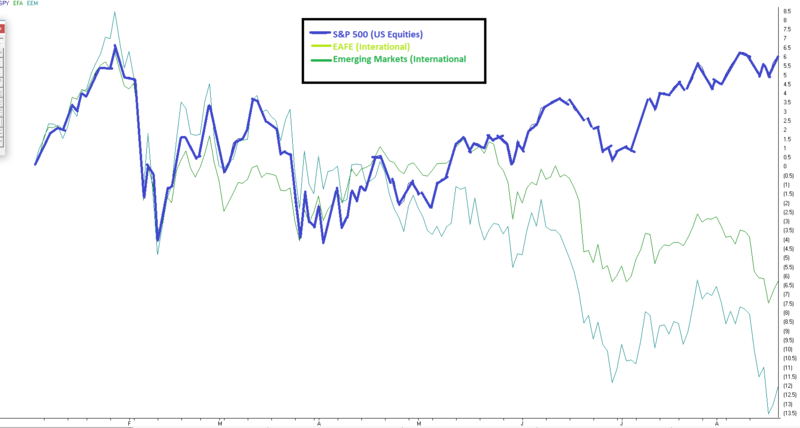 At the same time, the S&P begins outperforming while both the EAFE and Emerging Markets falter. We can also see from these two tables, the rankings of each asset class on a risk adjusted basis (using Canterbury’s Volatility Weighted Relative Strength indicator), beginning August 17th, 2017 to August 17th, 2018. From these tables, we can see that assets go in and out favor. Last year was not a great time to own the dollar, and it was a great time to own international equities. Today, the opposite is true. The dollar is strong, while international equities are weak. Since all assets will go in and out of favor, it is important to have an adaptive process that can put a portfolio in a position to limit risk and seek compounded returns. The Canterbury Portfolio Thermostat is an adaptive process specifically designed to rotate and adjust to ever-changing market environments. The Thermostat is composed of a unique series of algorithms that recognize securities that are in favor and out of favor. The Portfolio Thermostat rotates to always hold securities that create a bullish portfolio- one that has limited risk and potential for compounding.